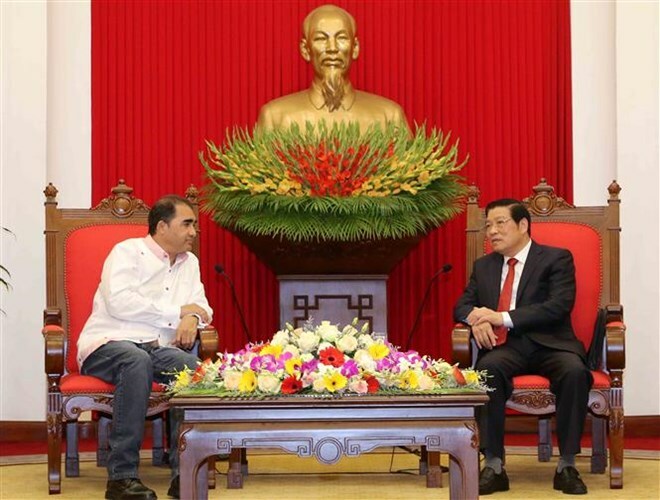 Hanoi (VNA) – Secretary of the Communist Party of Vietnam (CPV) Central Committee Phan Dinh Trac hosted a reception in Hanoi on April 5 for Ivan Blasser, in charge of the external affairs for Panama’s National Independent Union (UNI) Party, who is currently paying a visit to Vietnam. Trac, who is also head of the Committee’s Commission for Internal Affairs, thanked the people and progressive forces of Panama for their sentiments towards Vietnamese people in the country’s fight for national liberation and reunification in the past and the national construction at present. He expressed his hope that the traditional relations between the CPV and the UNI will serve as a sound political foundation for furthering Vietnam-Panama ties. In reply, Ivan Blasser spoke highly of the achievements of Vietnam’s Doi Moi (renewal) process. He also voiced his hope to enhance the traditional friendship between the two Parties to share experiences, especially those of Vietnam in Party building, socio-economic development, poverty alleviation, and hunger eradication. Previously, the Panamanian official joined talks with deputy head of the CPV Central Committee’s Commission for External Affairs Nguyen Tuan Phong and working sessions with the Vietnam Chamber of Commerce and Industry, the National Fund for Vietnamese Children, and the Vietnam National Textile and Garment Group.